If your site showing shortcodes on mobile then this post will be helpful to you, because here we are going to demonstrate you how to resolve this issue. This mainly happens when some of the other mobile theme conflict with the mobile design of Divi theme. Since Divi is a fully responsive theme so we don’t need to install any of the plugins for adjusting its view on mobile, tablet and other devices. If we are using jetpack plugin and If we have activated the “Optimize your site for smartphones”(as shown in the below image) then the generated theme design overrides the divi menu design. As we know that shortcodes are used for modules and these shortcodes are not used by “Jetpack” mobile theme, so whenever we view our site on mobile view shortcode appears. For resolving the issue, please disable all the mobile setting from the Jetpack Plugin. Hope this piece of writing resolves your problem related to shortcode problem and please don’t forget to provide your precious comment below for any other help. Is it the only solution to turn off the mobile theme in Jetpack? 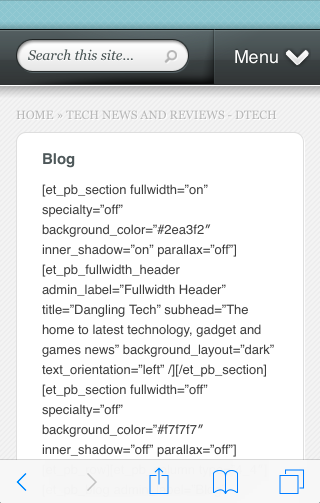 It’s a pity because my site was much faster (according to Google PageSpeed Insights) with Jetpack mobile theme. I would be happy if I could use this option without Divi codes showing up.